The Skids were a punk band formed in Dunfermline, Scotland by Stuart Adamson (on guitars, vocals, keyboards, percussion), Richard Jobson ( vocals, guitar, keyboards), Thomas Kellichan (drums) and William Simpson (bass guitar, vocals) in 1977. They signed to Virgin and issued "Sweet Suburbia" and "The Saints Are Coming" before shooting to popularity with top ten single "Into The Valley", from their first album "Scared to Dance". Both Dunfermline Athletic FC and Charlton Athletic FC use "Into the Valley" as a theme song. 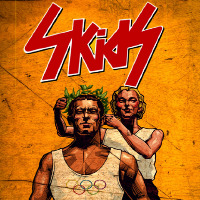 The Skids continue to enjoy popularity with two top 20 singles, "Masquerade" and "Working for the Yankee Dollar", from the album "Days in Europa", produced by Bill Nelson. The Cover of the album, showing an "aryan", was seen by some as Nazi, and was soon replaced with a less controversial sleeve. This sleeve, although conventional, still bore the image of the first release seen through the viewers eyes by a picture on the wall, alongside a picture of &apos;Scared to Dance&apos;, the sleeve portrayed a woman , bare breast showing, in the hands of a man. The Absolute Game was The Skids&apos; 1980 third album (not counting the two different mix versions released of their second album 1979&apos;s Days in Europa) and was produced by Mick Glossop. It featured two new band members, Russell Webb (bass guitar, vocals, guitar, keyboards, percussion) and Mike Baillie (drums, vocals, percussion). Do you promote/manage The Skids? Login to our free Promotion Centre to update these details.